4x Child Safety Lock (brown&white) with magnetic key + 1 year warranty – The Good Stuff Co.
Safety Mag was inspired by moms who needed an easy to install universal locking system that would keep infants, young children, and pets safe from household threats. EASY-NO-TOOL INSTALL. PEEL, STICK, DONE! Respond to household dangers rapidly to keep your little ones safe instantly. Child proofing your home couldn’t be easier. Just peel back the strong adhesive tape, stick into position, and you are done. No screws, no drills, and no workman needed. It’s so easy, your grandma could do it in 60 seconds or less. The Mag Safe flexible strap system allows latching around corners on all types of surfaces. 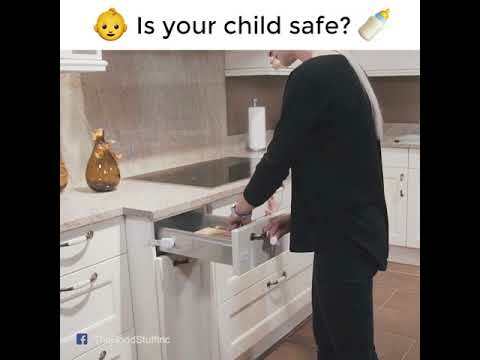 That means cupboards, drawers, fridges, oven’s, dishwashers, sliding doors, windows and just about any unsafe place your young child or pet could venture. These locks can be secured inside the home and garden. No need to spend the earth on expensive specialized safety gadgets. The Mag Safe is adaptable enough to secure a multitude of household dangers. Securing toilet seats, medical boxes, and electrical points (to give just a few examples) is a breeze. Select a shade that blends in with your fixtures and furnishings. The Mag Safe is available in light and dark shades designed with sleek modern lines to ensure a non-intrusive discrete integration with your home surfaces. You would be wrong to think the Mag Safe is just a temporary quick-fix gadget. This top quality universal magnetic locking system is built to last. The extra strong 3M adhesive tape can be used on wood, metal, ceramic, concrete, or plastic, just about any dry surface imaginable. Complete with a heavy-duty magnet and tough durable straps, you can rest assured of many years loyal service. Locks all fixtures and appliances. Low-cost solution to multiple hazards. 4 Locks + 1 Key + Key holder supplied. Magnetic key can be worn on the finger (kitchen use).